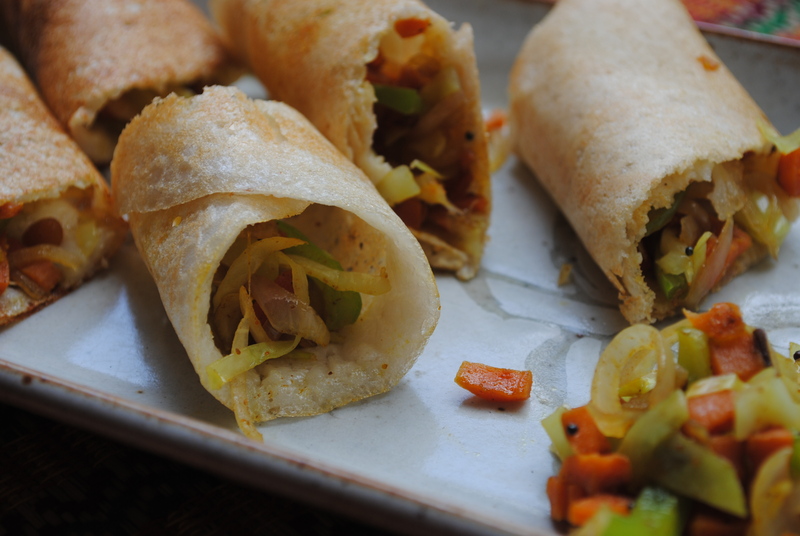 A few weeks ago, I was browsing for recipes that use Dosa batter and found Dosa Spring Rolls. I am a bit of a skeptic when it comes to giving food a Chinese makeover. For too many “items” including Chaat have gotten a Chinese makeover with disastrous results (according to me). I prefer mixing wheat or oat flour into leftover dosa batter and making dosas, or making appams with chopped vegetables and seasoning. The spring rolls looked easy enough to make and I am not one of those people who will talk without trying out something at least once. I had to try it. The fact that it made it to the blog means it got a thumbs up, for variety and ease of preparation. I saw this on Nag’s blog and from what I see a lot of people have made and liked it. So if you are looking for a way to glam up your dosa, add vegetables and sneak them into the diets of unsuspecting or fussy eaters in your family, or just a nice light dinner option, make this. On a hot pan, add ½ teaspoon of oil and add the ginger garlic paste (if using) and sauté for a minute. Add the rest of the vegetables and sauté on medium heat till the cabbage is just wilting. The vegetables should be crisp and retain their colour. Remove from the heat. On a dosa pan, add one ladle of batter and spread as thin as possible to make a 6 inch dosa. Drizzle oil and fry till golden brown. In the centre add 2 tablespoons of sautéed vegetables and roll like a spring roll. Remove onto a plate, cut using a sharp knife into 2-3 pieces. Thanks for sharing such a tasty recipe. I had tasted this recipe on my friends wedding reception. But i don’t know how to cook it. Now i will definitely try to cook it at home. thanks! it isn’t an original idea…but do try it out! yes, we need to rebrand & reposition to sell to these men!